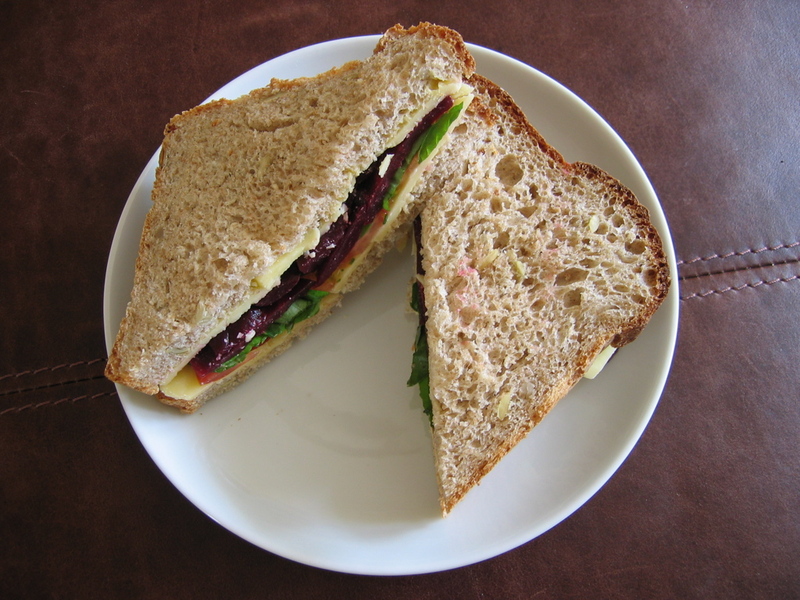 Posted by cath in bread, freeze-friendly, Info and Cooks Notes, Recipes, specials, variations. Here’s a new bread recipe for the new year. Sourdough Experiment 1 – Prooving slowly in the fridge for 3 days. This is something I’ve been meaning to try for a while – sourdough. I’ve read that this is best made by using a small piece of dough kept wrapped in the fridge from the last batch of dough and kneading it into the next. Now, I haven’t got that far yet, although a small ball is currently fermenting in the fridge for the next sourdough experiment! Meanwhile I tried a long, slow proove of half of my weekly dough batch to see if I could get a slightly sourdough effect. I was very pleased with the results. Day 1: Make a large batch of your favorite dough. I made two loaves with this amount of dough – 1 for immediate use, 1 for sourdough, so each loaf was 300g baked in a small bread tin (otherwise I would freeze the extra dough for use another time). 300g strong wholemeal and 300g strong white flour, 1.25 tsp dried yeast, 1.5 tbsp sugar, 2 tbsp milk powder, 1.5 tsp salt, 420 ml water and 3 tbsp walnut/olive oil mix (instead of butter) with 4 tbsp pumpkin, 2 tbsp sunflower and 1 tbsp linseeds). See my bread recipe for other options and more details. For full instructions in making dough see this post. Now for the new stuff… Prooving dough overnight in the fridge makes the loaf a slightly different texture, so I wanted to experiment with that effect. Dough does rise in the fridge (albeit slowly), so put the dough in a medium bowl (at least twice the size of the dough ball), covered with oiled clingfilm (oil-side down) and leave it in the fridge overnight. Day 2: In the morning, the dough should had risen, so push it back down into the bowl – effectively knocking it back and removing the air. Then place back into the fridge. Repeated that in the evening and again in the morning of Day 3. Day 3: Turn out the dough onto a floured surface (use bread flour again) and knead it for a minute by hand to remove the air bubbles. Then push the dough ball into a flat, roughly rectangular shape the length of your bread tin. Roll it up like a Swiss roll and place in the oiled tin. This should gives a perfect size and shape to fit the bread tin. Replace the oiled clingfilm loosely and put it back in the fridge for 4 or 5 hours (minimum) where it will slowly take shape. Remove the bread from the fridge to warm up to room temperature and finish prooving before banking, this will take an hour or two – don’t let it puff up too far. Once it has shaped, put it in a pre-heated oven (at least 210 deg C) for about 20 minutes (longer for larger loaves) until it is browned and sounds hollow when tapped. Turn out onto a wire rack to cool. For a crispier crust on the base and sides, try removing the bread from the tin for the last 5 minutes of the cooking time – excellent if you’re checking the bread for hollowness and it’s not quite done. Accidentally left your dough to rise and puff up too much in the tin? Don’t panic! Just push it back in, removing all the pesky air bubbles and then wait for it to reshape again…just try to check on it more regularly to avoid it going too far. Your aim is always to double the size of the shaped dough that you put in the tin. The great thing about dough is that it doesn’t mind the odd hiccup, it will just need time to rise again. Posted by cath in bread, freeze-friendly, Recipes, variations. I tend to make small loaves that fit well into my 2lb bread tin from Lakeland. The quantity is roughly 400g flour plus the other ingredients. You can also add dried or fresh herbs, curry powder or pastes, fried onions, sundried tomatoes. Try your favourite ingredient in bread and share your experiments with us here. Lightly oil the bread tin all over, place the prooved and knocked back dough into the tin and leave to rise into a full loaf. I recommend a fan oven temperature of 210 deg C, that's about 230 degrees in a conventional oven. Also as you heat up the oven, put a tray of water in the bottom, this produces a better crust, less blackened by the heat. Cook your bread loaf for 25-35 minutes until browned and crusty on top. It should come cleanly out of the bread tin and sound hollow on the base when tapped. Posted by cath in bread, freeze-friendly, general info, help, Info and Cooks Notes, ingredients. With easy to use, dried yeast sachets, everyone can make great bread at home. 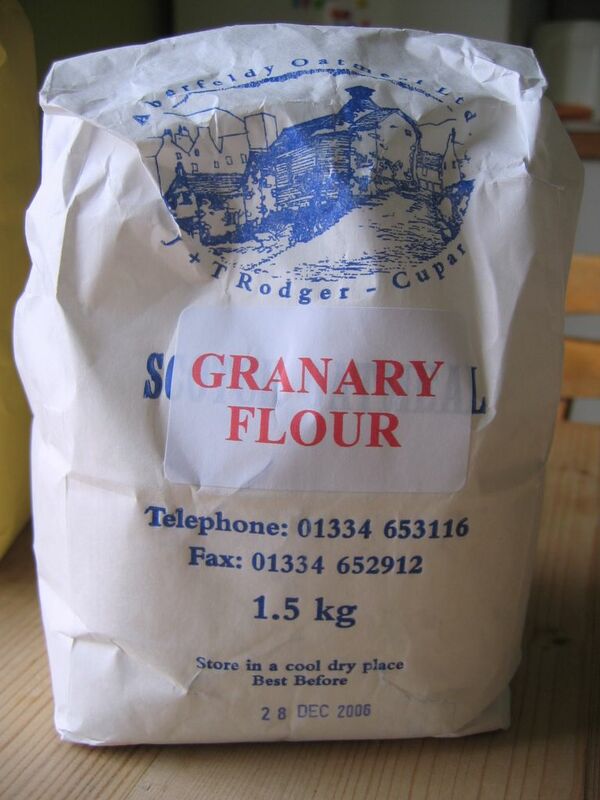 The only other things you’ll need are: a quality stoneground strong bread flour (White, Wholewheat, Granary or a mixture), salt, sugar, butter or oil and water. You can add seeds, nuts, curry pastes, dried fruits, herbs, anything you like really to the basic dough. At the moment I’m using a very good bread machine (Panasonic, Sd-253) – although, you may be surprised that I don’t cook my bread in the machine. I use the dough only programs. Bread looks much better and gets a lovely crispy crust if you bake it in a bread tin the oven – no matter how you make the dough. You can knead it by hand – this is actually not hard to do as you have to be rough with bread so as long as you give it a good 15 minutes of stretching, folding, turning, thumping, squishing, rolling and whatever else you like, it should be fairly happy. You can use a dough tool or hook in a food processor – simply add the dough mix, along with water at room-temperature (this is crucial) to the processor and letting it knead the bread for 5-10 minutes. Use a bread machine – in this case you are best to follow the instructions in the guide book. Some machines offer a dough-only option, so you can set them up to make the dough for you whilst you’re at work. The machines include resting periods, kneading and the dough can be left in the machine to rise slowly after the program has finished. Of course, in the bread machine, you can just let the bread bake as well. However, adding the extra prooving and maturing time, and turning the bread out to bake in the oven produces a far superior result. The longer prooving time gives a better texture and you may be surprised at the weight and substantial feel of the resulting loaf. Tip # 1: Let dough rise slowly, you can proove bread dough at room temperature, or even in the fridge overnight. Once you’re satisfied with the prooving, it’s time to knock the dough back – this just means to pummel and throw it about a little to remove all the air bubbles, then kneading again a little. It only takes about 5 minutes and if using a machine to make the dough, that’s all the hard work there is! You then simply shape the bread into a fat sausage, put it in the bread tin and dust with seeds (optional) and a bit of flour. Leave the bread to rise and fit into the tin – usually you want it to double in size. The rate at which this happens depends on the temperature, but leaving it for a few hours at room temperature in the kitchen is usually sufficient. Pre-heat the oven to a very hot temperature, 210 deg C on my extra hot fan oven seems to do the trick (up to 230 deg C in an electric oven). Place the bread in the oven and bake for 25-35 minutes. It should be brown, cripy, and fall out of the tin when ready. To check it’s cooked through, tap the base – it should sound hollow. Leave to cool on a wire rack. Tip # 2: Put a tray of water in the base of the oven to improve the loaf crust during baking. Option 1: Start making this bread in the morning, place ingredients in the bread machine, start and leave to make Dough but not bake the bread. Get on with the day’s activities. In the afternoon/evening turn out the risen dough onto a floured (use strong bread flour) worktop. Knock the dough back, shape and place in a lightly oiled bread tin. Leave, uncovered on the worktop (away from draughts) for about 1-2 hours. Pre-heat the oven, bake for roughly 30 minutes. Leave to cool on a wire rack overnight. Perfect for eating in the morning. Option 2: Start making this bread in the afternoon/evening, place ingredients in the bread machine, start and leave to make Dough but not bake the bread. In a few hours, the dough will be ready. Turn out into a large bowl, cover with clingfilm and place in the fridge overnight. Remove the risen dough first thing in the morning and allow to warm up a little. Turn out onto a floured (use strong bread flour) worktop. Knock the dough back, shape and place in a lightly oiled bread tin. Leave, uncovered on the worktop (away from draughts) for about 1-2 hours. Pre-heat the oven, bake for roughly 30 minutes. Leave to cool on a wire rack before cutting. The bread should be ready to eat by lunchtime. Other options: The bread can be left to rise for longer in the fridge – for example overnight and the next day. Make sure you use a large bowl to allow the bread plenty of room to expand. 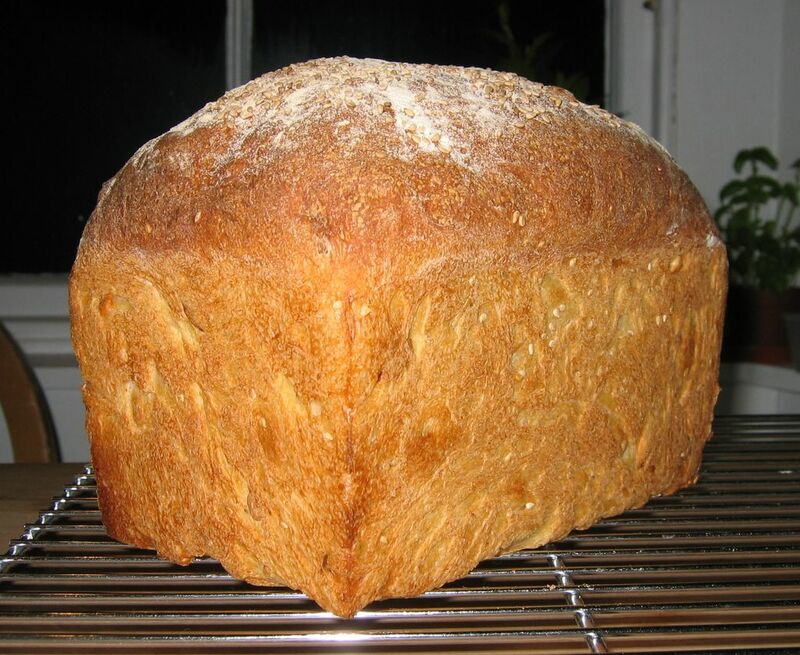 Homemade bread does not keep fresh for long periods like store-bought sliced loaves. 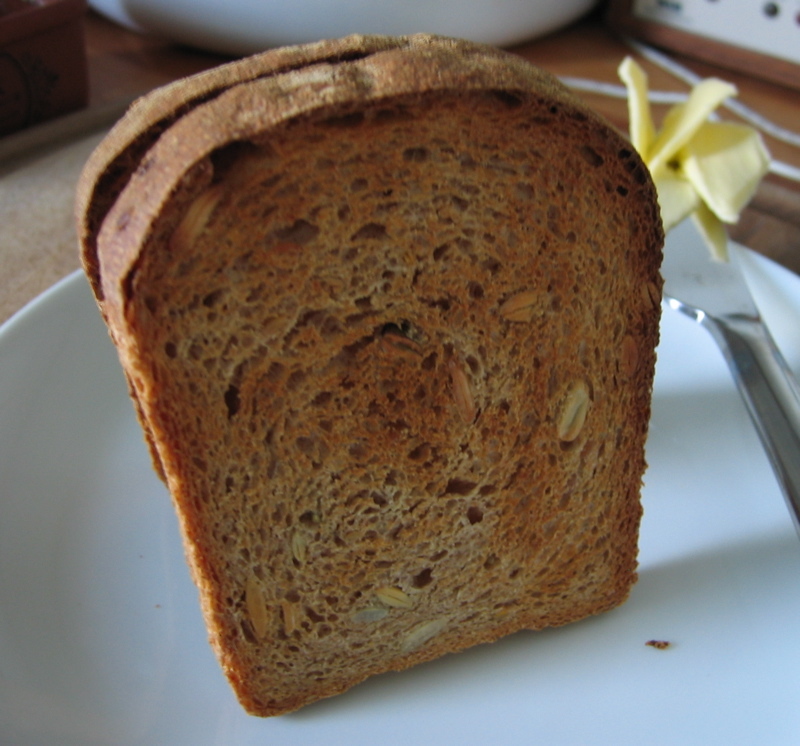 Wholemeal breads tend to go stale quicker than white breads as well. Best to store them in a bread bin. I also use a cotton bread bag to store bread inside the bin. The crust will soften after storage, which is why leaving it out overnight to cool keeps the crust crisp. Once cut into, bread will quickly stale. Freezing bread is a good option. Freezing a whole loaf is a good idea if you eat a lot of bread. Freezing slices is better if you only need the odd bit. The slices defrost quickly or can even be toasted straight from the freezer. Another option is to refresh your bread from the tin. Wrap in foil and place in a hot oven for 5-10 minutes to recrisp the crust and improve the texture of bread that has softened and begun to stale. Of course, slightly stale bread toasts well. 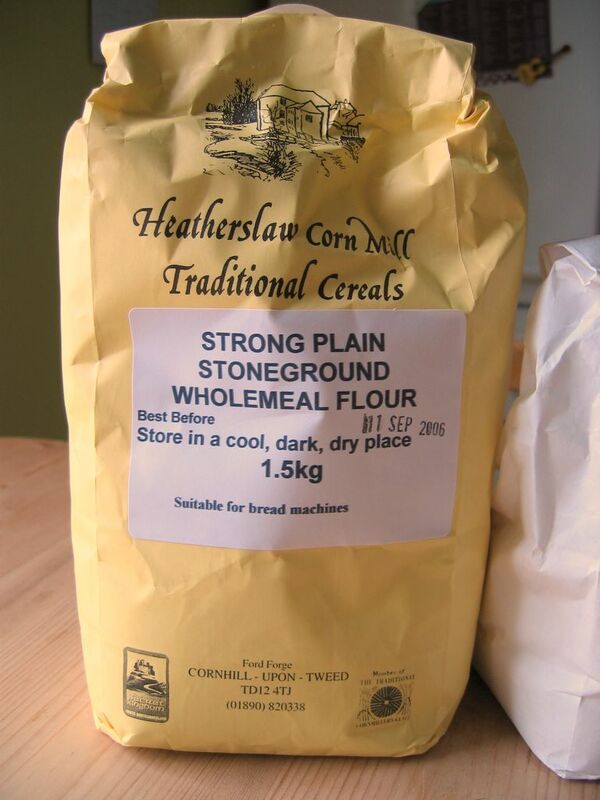 Also use up stale bread by processing to crumbs and storing in the freezer – can be used in many recipes. Tip # 3: Look out for stoneground bread flours from local mills, the flour is much more nutritious and produces high quality, nutty flavoured bread. How much bread to make? One 400g (weight of flour in dough) loaf makes a medium loaf easily makes 4, two-slice sandwiches, and several slices of toast or some breadcrumbs. You can make larger loaves, just the same method – maybe adding a little extra cooking time for a very large loaf. Alternatively, make a large batch of dough and use it to make 1 loaf and a number of small rolls (shape, allow to proove again and bake for around 10 minutes in the oven). The extra dough for the rolls can also be kept in the freezer until required before prooving and baking. Similarly, made dough for loaves can be frozen until required. Tip # 4: Cold and frozen dough will take much longer to proove. It needs to warm up to room temperature first before it really starts to increase in size. This just means a longer wait, which is why you may prefer to bake and then freeze any extra bread for use another day. If you are using frozen dough, take it out of the freezer in plenty of time – defrosting it and bringing it up to room temperature may take up to 24hrs. Warning: Once you’ve started making bread, nothing you can buy in the supermarkets will ever be good enough again! However, you can get good quality baked bread from small bakeries, farmers markets and health food shops as well, so you don’t have to bake all the time!